Chuck Missler examines trends among Israels history and leadership, and gives insight into where Israel is going, and what to look for in the way of Biblical prophecy concerning Israel. Chuck Missler examines the growing tensions in the Middle East, and what implications the rapid growth of Islam will have on Israel, and end-times prophecy. Chuck Missler examines Libya's continued efforts to produce chemical weapons, and how its allies are interfering with efforts to stop them. Chuck Missler examines the significance of Russia's conitnual upgrade and enhancement of its nuclear weapons systems, even in the face of the START treaties. Magog is arming itself! Chuck Missler discusses the prophetic significance of the birth of a red heifer in Israel and how it relates to the coming Temple and end-time prophecies. Chuck Missler gives an early look at the growing military build-up in Russia, and what the Russia/Iran alliance means in terms of Ezekiel and Biblical prophecy. John Loeffler examines the historical roots of Jerusalem, and refutes common misconceptions about the origin, history, and rightful possession of Jerusalem and the lands of Israel. Chuck Missler examines the Old Testament covenants regarding Ancient Israel, and how they relate to the Modern Church and Judaism. John Loeffler describes Israeli / Palestinian relations, and the difficulties of coming to a peaceful decision about who controls Jerusalem and the Golan Heights. Chuck Missler considers the current struggle over the unreasonably popular city of Jerusalem, and reviews God's own special purpose for this Biblically significant piece of property. John Loeffler describes the increasing instability in the Middle East as the peace talks deteriorate; the demands of the Arabs and the survival of Israel are increasingly seen as incompatible. A look at the rabbinical debate raging over how to handle Shmitta, the sabbath year for the land as dictated by Leviticus 25:3,4. Will Jewish farmers lose their land if they take the Scriptures literally? Carol Loeffler considers the recent election of Ariel Sharon, and compares his conservative stance to Ehud Barak's past willingness to concede to the Palestinians. The Christian Church has allowed humanism to take over the governments and schools of the western world. As this atheistic worldview pervades even our churches, what can we do to battle for Truth? Israel came into the cross-hairs of a global gang up during the conference, which ostensibly was geared towards reducing hatred and racism. The worldwide war on hate is not only failing but is causing a substantial increase of hatred. Israeli prime minister Ehud Barak offered a series of concessions to Yasser Arafat and the PLO, in hope that giving up land would bring peace. However, the efforts failed. Will any Israeli action bring peace in the Middle East? Chuck Missler reviews the historical roots of the modern day Russians and the peoples to which Ezekiel referred when he prophesied about that land of Magog. Chuck completes his three part series on history of the Middle and Far East and Russia, covering the Huns, Khazars, Seljuks, and mighty Mongols, including Ghengis and Kublai Khan. Middle East Update: What Does Post-Saddam Mean? Barry Rubin, the director of the Global Research in International Affairs (GLORIA) Center at the Interdisciplinary University describes what the Iraq and the Middle East may look like after Saddam is removed from power. The recently proposed 'Road Map' peace plan has been met with both criticism and support. However, is offering the Palestinians a state enough to bring peace to the region? In January Israel's Parliament, the Knesset, came to the conclusion that there is room for a Judeo-Christian alliance to help Israel and to recognize the great support received from evangelical Christians. The Most Important City in Iraq: The World Capital? Chuck explores the prophetic implications behind the current situation in Iraq and the rest of the Middle-East. Mid-East Update: What Happens Now? Chuck examines the front-running candidates that are hoping to replace Ariel Sharon as prime minister of Israel. Barry Rubin, Director of the GLORIA Center, lends some background and context to the continuing tragedies happening in this war-torn country. 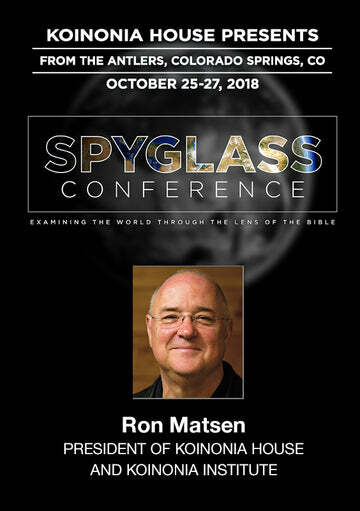 Chuck hostsThe Issachar Tour, Koinonia Institutes one-of-a-kind experience to Israel that will give our explorers an INSIDERS look at the Israel of today. Avi Lipkin discusses the key to understanding the war that is coming against Iran and the war that is going to return the fanatic Shiites to Sunni subjugation. Chuck Missler talks about his recent 2007 Issachar Tour of Israel. Dan Stolebarger, Executive Director of Koinonia Institute reviews the book Schmoozing with Terrorists. Dan Stolebarger, Executive Director of Koinonia Institute speaks about Hamas and Hezbollah. An Open Letter to President Obama from Brigitte Gabriel, Founder and President of Act! for America. A Feasibility Study: Will Israel Attack Iran? Mary Miller of Koinonia Institute writes about middle East tensions. Chuck Missler writes about Islam and its threat to world security. Amy Joy Hess writes about the Libyan crises. The Arab Spring and the rise of Islam in the region may prove to be the key to Turkey’s emergence as a true regional and world power. Despite the many friendly speeches U.S. President Obama made in Israel last March, there is evidence of a secret document that reveals his real policy for the Middle East and Islam. Guest Article Is the Beast at the Door, While the Watchmen Sleep?